A young Jewish man became the victim of an unprovoked attack and was punched in the mouth while walking on Kingston Avenue Sunday Evening. The incident occurred on Kingston Avenue near Crown Street at around 9:30pm. The young man crossed paths with a group of about 10 black males, all in their late teens and early 20s, when one of the group suddenly punched him in the face. No words were exchanged between the group and the victim. Over an hour later the young man told CrownHeights.info that his teeth still hurt, but thankfully he was otherwise unharmed and did not require medical attention. Shomrim were called to help translate for the victim, who speaks little English, and assisted him with filing a police report for assault. 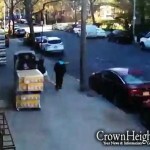 This incident marks the second random attack against Jews in Crown Heights in less than a week. In the previous incident, a 12-year-old boy was assaulted by two black males, who were part of a larger group of about 15 black males. Police are treating both incidents as possible hate crimes. Update: As several commenters pointed out, the young man was not the only victim of this group of hooligans last night. It appears they were playing a sick game called “knockout,” which is gaining popularity among inner-city youth at a startling rate. The game is exactly what it sounds like, as this CBS report explains. Warning: The following video contains graphic graphic images and is not intended for children. Please view at your own discretion. Imagine if this were white kids knocking out blacks. There would be protests all over the country. So why is it ok, even funny to those on the video, when black kids do this? I know how to deal with them. Deblasio should appoint me next Police Commissioner. This was probably part of there game called “knockout”. Its were they come up to any random person on the street and throw one punch only and try to knock them out. On Kingston near Crown – there should be a videotape. Bring the red devil back!!! Welcome to de Blasio’s world. Expect more of the same….and where is the new commander of 71?? why are we quiet ? why are we not going to the community counsel and demand protection ? why are we sitting ducks , waiting for one of you getting punched ? that’s what it is. Why do we, in Our Community, keep having to look over our shoulder. Do we need to be Vigilant all of the time. Can’t we be confidant, and walk the streets without the fear of being attacked. So if you saw it coming you should have called Shomrim before it happened and you may have prevented it. Time to move to the suburbs or a republican state. Call it the deblasio handshake. y are their faces blurred? don’t we deserve to know who these nuts are? WHITE PEOPLE NOW HAVE A GAME CALLED “Mace the black kids” COMING TO A COMMUNITY NEAR YOU…. When it’s windy the mace might blow back to you. However if you use .22 it has enough momentum to overcome the wind. Knockout is a “game” where some sick creep tries to knock a passerby unconscious with one punch. The assailant is always black. The victim is always white. 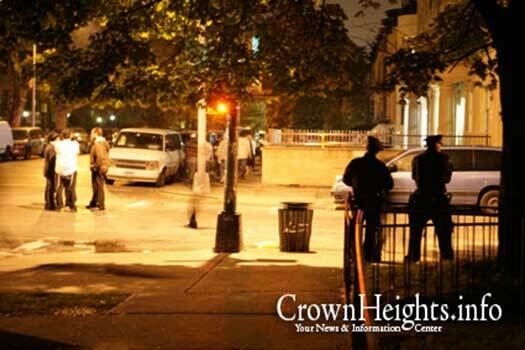 Crown Heights is the first and only place I lived in that I saw someone murdered in front of my apartment. I moved to Los Angeles and its not perfect but it’s not any where near as dangerous as Crown Heights. Please explain how this is a place of blessings. This is a place of assaults, murders, muggings, fear to go out at night, even the Rabbis are against each other. How many animals on the JCW List roam the streets wild with acces to children unrestricted. This is a place of blessings?!?!?!?! Los Angeles is full of gangs. It’s far more dangerous than NY on any given day. The Rebbe said 2 stay in CH not 2 move 2 Willi, BP or FB, & they say that it is better since the riots, look wats goin on. Even b4 the 12 yr old there were other things happenin 2 bachurim so its more than 2 incidents in 2 wks. We need 2 b like the ungarisheh & make them scared of us so they won’t do anything. There has 2 b a solution 2 this. If people want to move you would tell them to stay? I want to see them call it a “game” or start laughing after THEY become part of the “game” on the losing side! lets see their reaction then!. oh please don’t arrest them.. they were only playing…i have a brain clot but they didnt mean it it was a game!!! even apes in the zoo behave better! We need to find whoever is doing this and beat them to a pulp. where is jesse jackson ? How about bernard goetz ? all good comments here. I say what I’ve seen here before, and that is, that surveillance cameras are not THE answer, but they help in many ways. and YES, this was a hate crime, where is the support for that? Hashem help us please, bring us back to your light. I was on empire and albany the time the assault occurred and i am also a shomrim member. the group that you are referring to continued up albany towards eastern parkway so i don’t think it was the same group. in the future if you see something say something. call 911 and shomrim. Where are the leaders of the black community? (Am I even allowed to say that?) Why aren’t they cracking down on this? Have they given up on their own kids? Surely someone in their own community can figure out how to deal with them!! This is not in the media, that’s why. Guys ought to start walking around with baseball bats and start shlogging these shaygetzes empty little heads and put the fear of G-d back in them, knock some sense into them and show them the consequences of their actions. Maybe they will than have second thoughts about playing their sadistic little game. Nowhere is it written a Jew always has to play the victim. Yisroel Shemtov scared the living daylights out of these guys, we need someone brazen like him to put these black guys in their place! Me and my friend went yesterday for walk around 8pm,a group of black teenager came down Albany from carrol st to montgomry st ,we were on Albany between carrl and crown,they looked like they are going to do some things , so we cross to the other side .its not a comftabull situation ,action have to be done aganse those animals ,talk to the police , make demasraition, we have to show them that they can’t do things like this in the raabi shchoona,כאן ציוה השם את הברכה. This behavior is brutish and disgusting. Why do these people in the video find this amusing? What does that say about the state of “mainstream society?” Are these children being taught nothing of controlling their evil impulses. And although I hate to make this a race issue, but if these thugs were white, they would be branded as bigots and charged with a hate crime. Double standards everywhere. I am absolutely horrified. This video brought me to tears. Why don’t detectives watch these on line videos and find the criminals?